Original Illustration on blank white cardstock. “Merry X-mas” on outside, “Yeah, well you’re weird, too,” on inside. Comes with envelope. Illustration on blank white cardstock. Comes with envelope. Original illustration on blank greeting card. Comes with envelope. Block print card of woodpecker, with hand painted red crest. Only available on white cardstock with blank inside, comes with its own envelope. Hand printed block print on white or brown card stock, blank inside. Comes with its own envelope. Block print greeting card, blank on the inside, hand painted wings. Available on white or brown paper, with envelope. This card is a hand carved block print with hand painted eyes. It comes blank on the inside and can be ordered on white or brown card stock. It also comes with its own envelope. 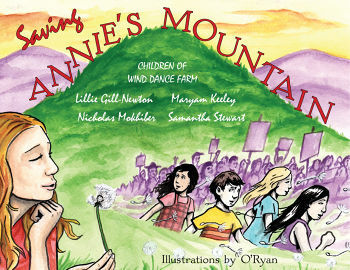 “Saving Annie’s Mountain” is printed and ready for order! 32 pages of full color illustrations, plus illustrated end sheets, and a wonderful story written by the children at Wind Dance Farm!